So that's one off my bucket list, I had always dreamt of going to see Neuschwanstein (new-swan-stone) castle, but I never dreamt I would get the opportunity so soon. One of Ben's friends has moved to the beautiful Erlangen, which we were more than giddy to see but then when Ben said we'd be renting a car to drive to the castle I did pee a lil'. Special thanks to them for inviting us and taking us to such gorgeous places. We had the most amazing long weekend, and we couldn't have wished for better weather when we went to Neuschwanstein on the Friday. The scenery alone was simply breathtaking. 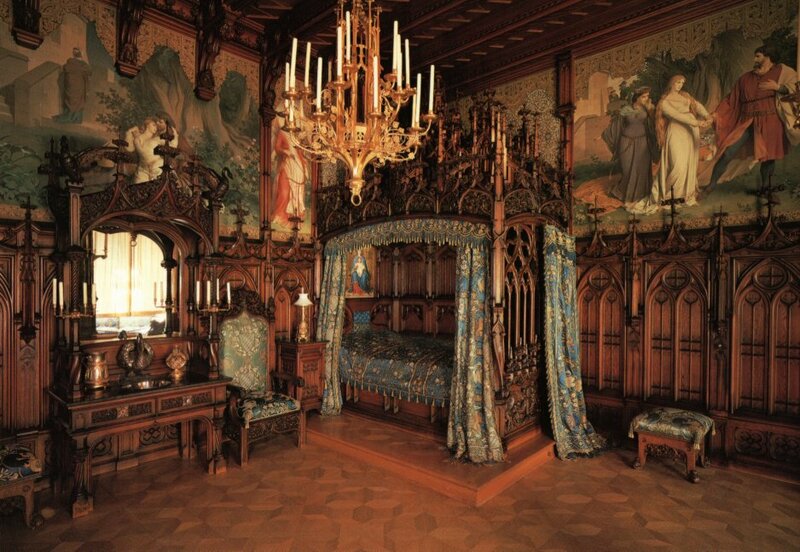 We had the tour inside the castle through the handful of completed rooms, King Ludwig's II bedroom was my favourite it had the most amazing carved bed you've ever seen and a swan for a facet! Apparently there are two secret doors - one for his loo and the other for bed linen - not very dramatic but still exciting nonetheless. If you follow me on instagram you will know I finally got my mitts on an Edwardian day dress, so it seem entirely appropriate to wear to the castle. Benji's beard is so ginger and magical ain't it? All in all I want to emigrate to Germany, don't get me started on supermarkets over there, fricking pastries to die for! Don't worry I have more sight seeing snaps to share aha. How totally glorious! I so long to visit Germany...it's on MY bucket list for sure! You are a total babe, such perfect travel dressing! Ha, G gets a good bit of ginger (and grey) in his beard too! Oh how interesting, might have to get my mitts on a copy, it's sad that his family didn't let him finish the castle! You look magical in that dress with the castle as a backdrop! Oh, Neuschwanstein is really 'wunderschön' ;-) I have visited long time ago and now I want to go back imidiately! Your outfit is really gorgeous... this dress is adorable and also the jacket! I already want to go back hah, must have power of people. Thank you! oh wow! thanks for sharing this post! i wish i could go there too! amazing!